Ring ring... Hello, its me. You look fantastic! perfect mix of dark colors and red details. 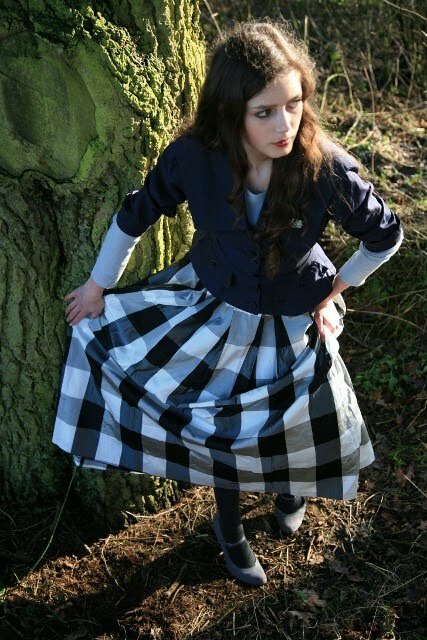 I love long skirts, give me the impression of being a princess being careful with pools and holes in the ground. It is very feminine. you are beautiful in this outfit. PS: I'm crazy with these red phone boxes in England - are pure charm. Really love that outfit, the skirt is great. I love your top!!! And the phone box is awesome!! I agree, the red telephone boxes are beautiful! I love the blazer you're wearing. The combination of colors is wonderful! That's a really great skirt! I love English phone boxes...they remind me of happy trips to England to visit my mom's family. We actually have two phone boxes here in Atlanta and I had been wanting to use them for a shoot. I love your skirt, and like you, I am suddenly being drawn to longer skirts. They are so pretty and feminine, especially the way that you styled this one. Love these photos! I've always thought those phone booths were so cool and wanted to take photos in one. Unfortunately they are few and far between here! Then, we thought : TARDIS. Great shots. 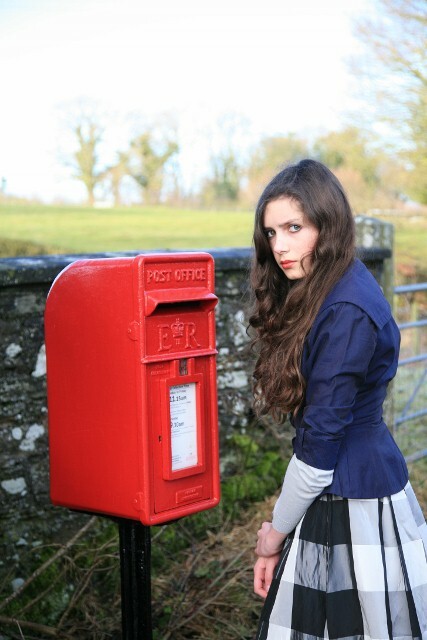 I love the contrast of the red phone box with the black and white skirt. You should try and edit your photo so everything is black and white and the phone box stays red. I used to live near a row of phone boxes, about 6 or 7, it makes for a great shot. Search images on Google : Red Phone Boxes Flag Market Preston '08. It's the first image that comes up. um, that skirt is easily one of the best i've ever seen. stunning pictures, as well. loving this outfit a lot. not many can pull off a full plaid skirt, but you look AMAZING! ps. paris??! how exciting, can'tr wait to see what you got! thats a beautiful photoshoot. 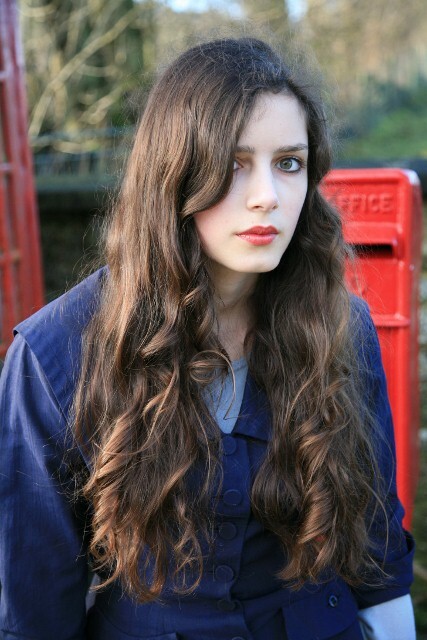 the rustic telephone box... and your clothes are gorgeous! i've read through all your blog, and you have a wonderfully unique and amazing style! You make me want to wear long skirts again! You're also wearing my favourite colour palette - blue, grey, black and white. The colour of your lipstick is a really great punch of colour. Also, your fantastic hair has inspired me recently to go back to my own natural brown colour, having been a blonde for about a year. And thanks for the comment on my blog! I'd love to see that Vogue shoot you mentioned. I adore the last picture. That skirt is so cool! So I just came upon your blog and I think it's absolutely amazing. Very inspirational and gorgeous photographs. I love these photographs and the outfit. These photos are just lovely. 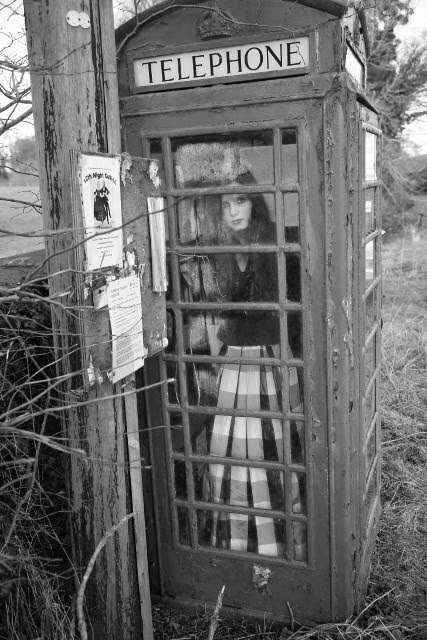 I love the shots of you in the phone box - they're such an iconic British landmark, I wish they hadn't got rid of most of them. Where you live looks stunning, too. Best wishes for learning French. It would be so satisfying to speak that beautiful language. I can't wait to see your vintage finds from Paris! Another delightful post, Roz. The skirt has just the right amount of drama, pattern and sheen. 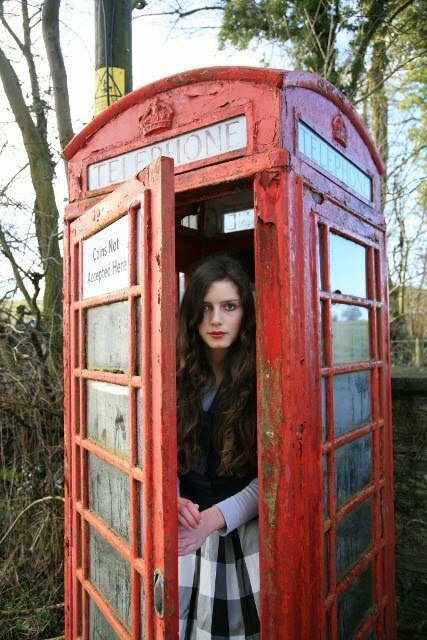 i love these photos esp the telephone box!